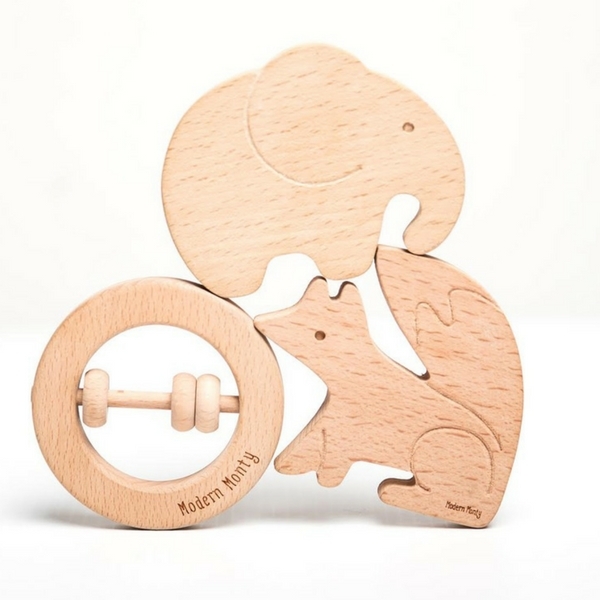 Modern Monty toys are designed to provide joy in their minimalistic, modern appearance for Mums and Dads, while also meeting the sensory and developmental needs for baby. Modern Monty is run by Mumma and Papa team Meg and Kelvin, and inspired by their baby Hiro. Meg has a background in mental health services, and Kelvin in photography. Both are creative perfectionists who love to create beautiful things, particularly from natural beech wood. Modern Monty was born in Melbourne, but has since moved to the sun and sand of Peregian Beach, in sunny Queensland. In between designing new toys, fulfilling orders and keeping up with their loyal Instagram followers, you’ll find this family of three exploring The Sunshine Coast. Tell me how you came to start up Modern Monty? Our little man, born late in 2015, inspired the creation of Modern Monty. When preparing for him to arrive, setting up his nursery and searching for toys as he grew, we found a gap in the market that we were passionate about filling. We didn't gravitate towards a lot of the mainstream toys and children's decor we commonly saw in franchised children's stores. We didn't like the feel that the garish colours and shiny, plastic materials created. We wanted to create toys that fulfilled the modern brief in appearance, whilst also stimulating bub's auditory, visual and tactile senses to support their development. We were keen to reflect our respect for the Montessori ideas about education and play in our designs as well. Montessori toys are traditionally made of natural products like wood and are quite simple in appearance, though encourage exploration of the senses, problem solving and imaginative play. What is your favourite customer message? Every message from a happy customer makes my heart sing! It is truly the best feeling to know something you have carefully designed, made and packed, is well received. The messages about the quality of our toys really stand out. Quality is so important to us, and so when customers pick up on this it really makes all the hard work worth it. What is your most amazing achievement at Modern Monty? I think being able to convert it from a hobby business to where it is today solely on social media marketing is our biggest achievement. With the algorithm changes on Facebook and Instagram a lot of social media advertising is hidden from followers, unless businesses are willing to pay a lot of money to “boost” posts, which we usually cannot afford to do. Many other businesses struggle to get off the ground for this reason. How do you balance running a company with being a Mum? Nap time hustle is my life now! I get the most work done when Hiro is sleeping. He is just getting to the age now that he will play independently at my feet while I do some work, which has been amazing. But I don’t want to spend all his waking hours working. The biggest perk of having your own business is so that you have the flexibility to work when you want to! What has been your biggest parenting challenge and highlight? Biggest challenge is hands down the sleep deprivation due to night waking. People tell you about it beforehand, but the reality is just beyond what I ever imagined. I have certainly shed exhausted tears from time to time at the thought of facing another busy day after only a few hours of sleep. However, the biggest parenting highlight outweighs the biggest challenge easily, and that is the overwhelming, heart exploding love I feel being there with my son as he grows into the funniest, cheekiest and most cuddly little boy. Seeing his little personality shine is just incredible! As long as I have had enough sleep, I love the early morning snuggle with Hiro as we both wake up ready for the day. All the other men and women out there working hard to do something meaningful to support their family. It’s not always glamorous, and it is often more challenging than it seems. I know how hard it can be. So to see others doing it, and succeeding at it, is so inspiring to me.